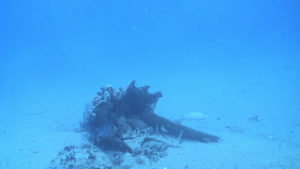 The 2011 field season of the Egadi Islands Survey Project was successful in that the battle landscape, or at least a portion of it, for the Battle of the Egadi Islands was located. This is the first naval battle landscape from antiquity located, and importantly done so in an archaeological manner. The numerous finds are made more important than their inherent rarity for addressing crucial archaeological questions by having their provenience recorded, their associated finds collected and recorded, and their subjection to various analyses. The contextualization of the material, both spatially and temporally, allows significant hypotheses to be addressed and formulated from this data. 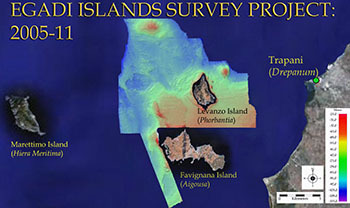 As noted, the primary discovery during the 2011 field season was the location of at least part of the battle landscape for the Battle of the Egadi Islands; a naval engagement that ended the First Punic War in 241 BCE. 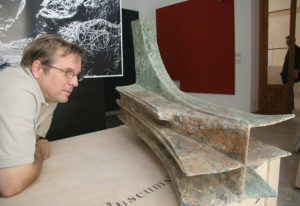 The finds were concentrated in a relatively small area and included: bronze warship rams, bronze helmets, and amphoras. 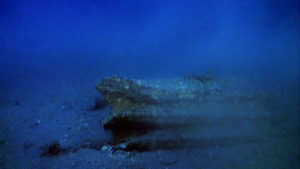 Also located during ROV investigation were five individual finds of amphoras. During ROV operations, 175 amphoras were located on the seafloor; each had its position and depth recorded. These amphoras were in varying degrees of condition, yet nearly 70% were intact. Five examples were raised for analysis. Their distribution is a scattered pattern over an area at least a km long. 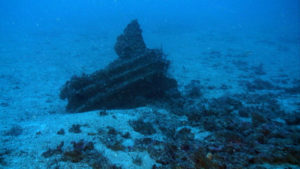 There are no areas of concentrated groupings indicative of a typical merchantman wreck site or formed by the dumping of drag net collections. This distribution pattern was most likely formed by their being dumped by a moving vessel at or near the surface, and likely not in an instant event. It is also possible that more than one vessel was involved. How far this amphora distribution extends is yet to be determined. 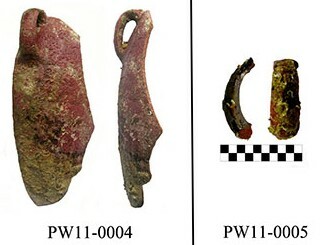 The Greco-Italic type V/VI amphora tops gathered near the Egadi 2 ram find area in 2009 are of the some type and fabric as those collected from the PW-A area. This further supports that drag nets moved the Egadi 2 ram along with Greco-Italic amphoras from the eastern portion of the PW-A area to the N nearly 6 km. 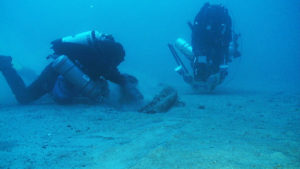 During ROV operations eight bronze helmets were located on the seafloor. Seven of these are in a rather concentrated area of c. 25 m2; the other helmet was found in the rocks c. 200 m to the SW and relatively close to the find location of the Egadi 6 ram. 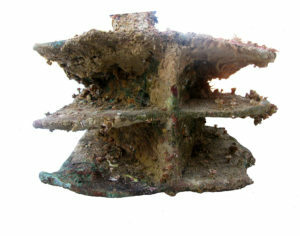 The helmets were in varying degrees of condition, most having sections missing due to corrosion and possibly post-depositional impacts as the metal is thin. Four of the helmets were collected and were of the same type as the three discernible helmets left on the seafloor: Montefortino. This is a type of helmet common to the 3rd century BCE with Celtic origins. As the Romans had adopted this helmet by this period and the Carthaginians hired Celtic mercenaries, it is thus far difficult to assign a cultural affiliation based solely on their style. 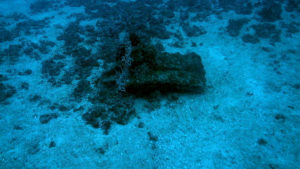 During ROV operations three bronze warship rams were located lying on the seafloor surface. 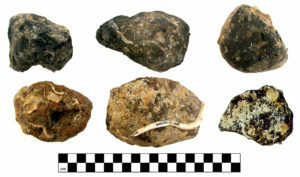 All of these rams from the 2011 field season were found in the PW-A area where the Egadi 4 ram was discovered in 2010. The rams were inter-dispersed with the amphora and helmet finds discussed above. 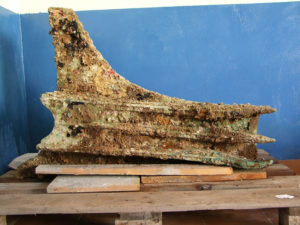 The primary damage exhibited on the Egadi 4 ram was the missing front portion of the starboard upper fin. The corrosion and growth indicate this was an old break; and given the clean nature of the break without associated deformation, the likely cause was cleaving off from a direct impact. This is likely a result of battle damage, and it may be hypothesized that it is a result of a ram-to-ram collision. This ram was in a deposit c. 110 m away from the Egadi 4 ram, where it laid broken on the surface. The entire port side as well as the cowl are missing from the ram. The breaks have growth and deterioration consistent with the damage taking place at the time of its deposition; hence, it is likely battle damage. The particular linear cleaving of the ram was most likely due to a frontal blow of tremendous force. With large sections missing it is possible to examine the cross-section of the ram and its casting features directly. Fortunately, the majority of the starboard half and the bottom plate survive so that it is possible to determine relatively accurate estimates of overall dimensions. 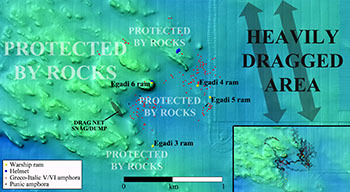 The Egadi 6 ram was found c. 500 m to the west of the Egadi 4 and 5 ram locations on the inner side of large rock outcrops. Although on the surface, the nature of the rocky area leads to the conclusion that the ram has remained in its original deposition position. 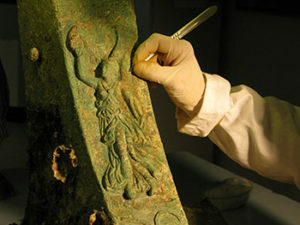 The ram was intact, was sitting upright, but no other artifacts were noted on the initial examination of the surrounding area. The ram had growth over all of its surfaces. The ram had slight bending of its fins at the head, and a small portion of the port lower fin was missing at the forward corner. 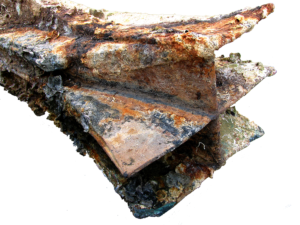 Remains of wood, green from copper leaching, were found within the keel section and wale sockets of the ram, and possibly at the head. Most interesting is the wood found between the upper and middle fins on the starboard side; a likely source for this wood is an enemy warship. Such contact would also explain the bending of the fin ends at the head. 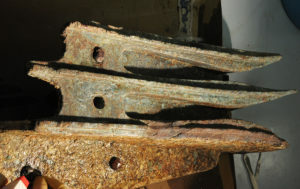 Nails were also found within the cowl that were straight, indicating that substantial timber remains were deposited with the ram. 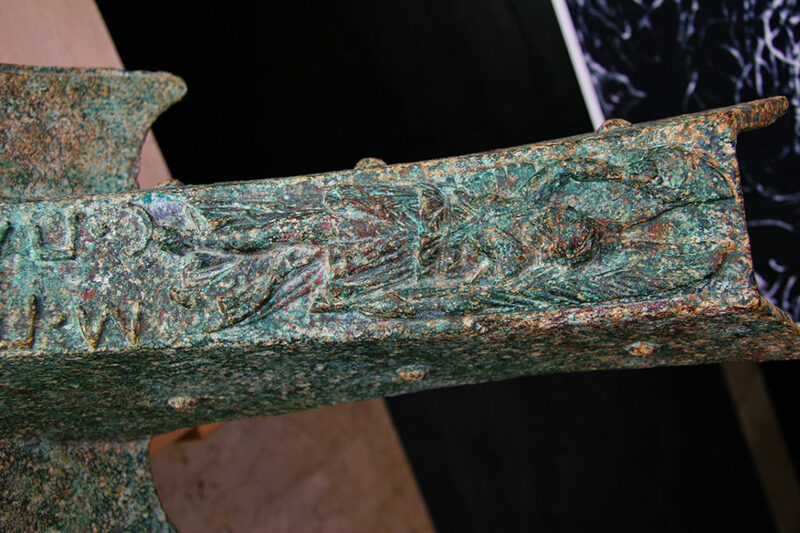 Both the Egadi 4 and the Egadi 6 ram (above, right, and second below) feature a relief figure of winged female figure facing towards the starboard side is situated at the top of the outer face of the cowl. 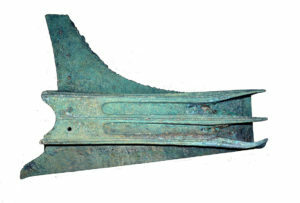 The figure is arranged upright to fit the narrow register provided by the cowl’s outer face. Her wings are folded downward and the laurel wreath is held above her head, nearly vertically, in her right hand. A sheave of wheat sits behind the figure, held in her left hand at its base.The female figure is assuredly one of two deities, or the version of a single deity, Nike or Victoria. It is my opinion that the image is Victoria based on several observations. First, the depiction of wheat in the image would more likely be associated with Victoria than Nike, who often had a palm leaf. Victoria’s origins are distinct from Nike’s, deriving from the Sabine goddess Vacuna who was also worshiped in Rome. Vacuna was an agricultural goddess that later became associated with numerous other goddesses including Minerva, Victoria, and Bellona. Victoria is also associated with Bellona, the ancient goddess of war whose name derives from the Latin “bellum” and had numerous temples in Rome. 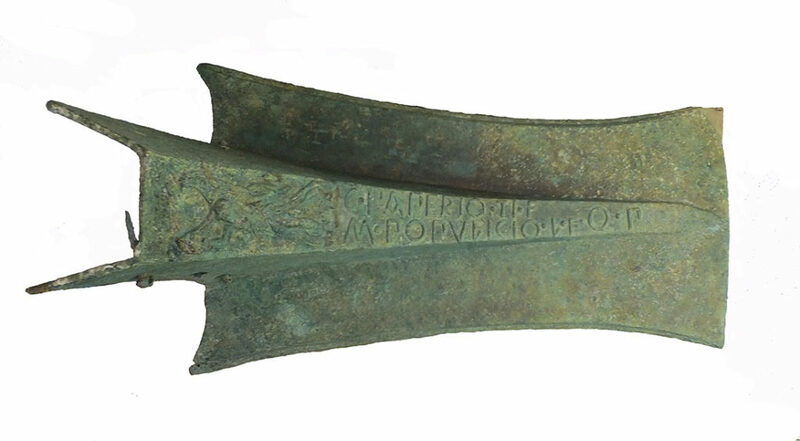 This association of Victoria and Bellona helped define another distinction between Victoria and Nike: whereas Nike was typically associated with victory in games, Victoria was consistently associated with victory in war. These associations and the fact the rams were produced by Rome as indicated by their inscriptions argue for the image being that of Victoria. M(arco) Populicio L(ucii) f(ilio) is listed at the top of the Egadi 4 Ram with the individual C̣(aio) Paperio Ti(berii) f(ilio) listed below (these same names are inverted on the Egadi 6 Ram). The Q.P postscript after the first name indicates that these two individuals served as Quaestores publici (elected public officials that dealt primarily in financial aspects). This position typically represents a first step for one seeking political office in the Republic. M. Populicius was known consul in 232 BC and may be identified with this individual so named as quaestor in 241BC. C. Papirius cannot, at this time, be identified with any known figure. This general interpretation of the inscription is predominately agreed upon by Jonathan Prag of Oxford University and Tommasio Gnoli of the University of Bologna.